Volcanic eruption in Eyjafjallajökull, 19th of April 2010. On 14th of April 2010 Eyjafjallajökull resumed erupting after a brief pause, this time from the top crater in the centre of the glacier, causing meltwater floods (also known as jökulhlaup) to rush down the nearby rivers, and requiring 800 people to be evacuated. 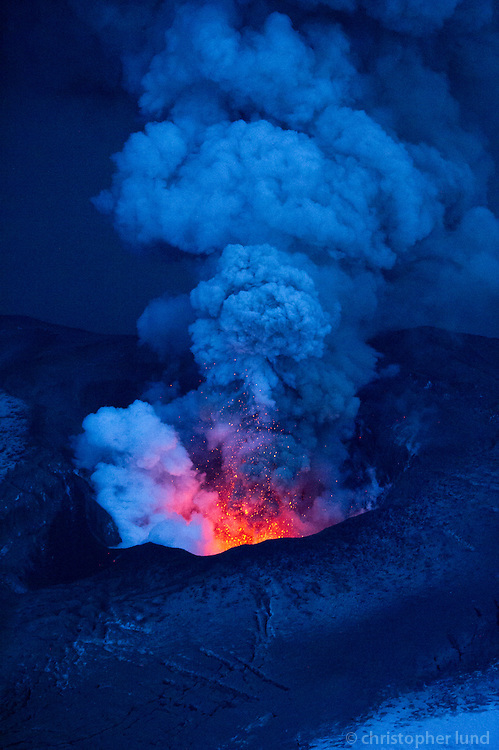 This eruption was explosive in nature and is estimated to be ten to twenty times larger than the previous one in Fimmvörðuháls. This second eruption threw volcanic ash several kilometres up in the atmosphere which led to air travel disruption in northwest Europe for six days from 15 April 2010, including the closure of airspace over most of Europe.